My Go2Guy performs a "Trash Out" of each property. This service is defined as removing and hauling away anything that may have been left behind in the home. If there are repairs that need to be done, we will also take care of those as well. We give the property a thorough cleaning and upon completion the home will be sale or rent ready. Save time, money, and aggravations while focusing on a market-ready property, not the problems left behind. My Go2Guy Handyman Services will clear, secure, inspect, clean and restore your recent rental return, evicted or REO foreclosed home in a One-Stop operation. My Go2Guy is an efficient, hassle-free and cost effective resource that you can always count on. Full digital pictures can be taken, and emailed to your REO department. 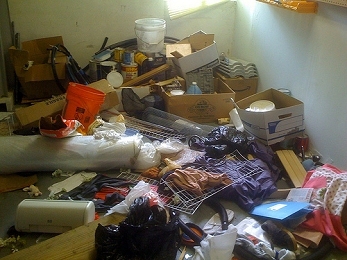 These will show the condition of the property before, and after the "trash out" has been completed. We will also be happy to take digital photos of any property that you want to just check up on. © Copyright 2006-2013 My Go2Guy Handyman Services, All Rights Reserved.